Flooring is generally attached to the sub-floor by means of a hidden nailing system, unless it's a specialty floor like the floating floor systems. Unfinished Flooring: Unfinished flooring is simply wood without any stain or sealer applied to it at the factory. This means that you can stain it to your choice of color, and make it as shiny or dull as you wish. It also means that there is more labor involved in the installation process. Flooring is generally attached to the subfloor by means of a hidden nailing system, unless it's a specialty floor like the floating floor systems. The nails are hidden by shooting them just above the tongue, through the flooring, and into the sub floor. When the next piece of flooring is installed, the groove fits over the tongue and the buried nail, as seen right. To finish the floor, follow the same steps as you would to finish any other woodworking project: sand the floor to get rid of irregularities and to open the grain somewhat. Apply the stain, or paint. Wipe the excess off if you wish. Then apply a urethane. 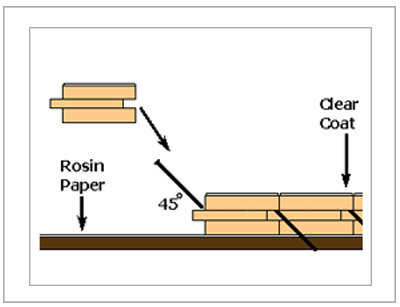 There are two basic sorts of urethane, a latex-based and an oil-based. Each has advantages and disadvantages.The latex dries faster, but this means that brush marks may be more evident. The oil based is easier to work, but takes more time to set up. In either case, allow the urethane to dry completely before lightly sanding and applying another coat. You want it to be very dry, so that you don't trap moisture within the layers, as this will soften the floor and ultimately can lead to severe problems. Prefinished Flooring: Prefinished flooring is installed much like the unfinished flooring, unless it is a specialty flooring such as the floating floors. They are blind nailed, which means that the flooring nail is shot in just over the tongue at a 45 degree angle. The nail is then hidden when the next piece of flooring is installed, when the groove fits snugly over the tongue. The last piece, over next to the wall is then face nailed in place. The prefinished flooring already has been stained and coated with a clear coat at the factory, so your installation is essentially complete at this stage. The factory applies multiple coats of clear finish, which should give you many years of a durable finish. This service does cost a little more, of course, but for many it is well worth it to get such a consistent and durable finish. Solid Flooring: Solid wood flooring is the traditional choice, and one that can last a lifetime with the proper care. We have it available in lots of different species of wood, from the traditional favorites like oak and southern yellow pine, to the specialty woods like maple or birch, just to name a few. The main advantage of solid wood flooring is that when the time comes to refinish the floor, you can simply sand it, restain it, and reseal it. The wood grain is consistent all the way through, since it's a solid peice of wood. You can't do that more than once with the engineered floors, and you can't do it at all with some floating floor systems. The disadvantage is that a solid wood floor can "move" a little more because of that gorgeous grain. Wood tends to shift a little as the temperature changes, and those shifts happen along the grain. To minimize the effects of this, most manufacturers recommend that you let the floor acclimate to the room before yo install it. Letting the wood sit in the room that will be its home for a few weeks is not unusual, since it takes a while for the moisture levels in the wood to settle to those of the room. Engineered Flooring: Solid wood flooring is the traditional choice, and one that can last a lifetime with the proper care. We have it available in lots of different species of wood, from the traditional favorites like oak and southern yellow pine, to the specialty woods like maple or birch, just to name a few. The advantages of this sort of product are its stabillity and its ease of installation. The different layers of the flooring give it a higher resistance to the conditions that will make a solid wood floor move, swell, cup, or otherwise shift a little. By alternating the fibers in the wood, there is no way for a whole peice of flooring to move in the same direction, because it will want to move along the grain. It is this stability that makes engineered flooring an excellent choice for floors over radiant heat flooring systems. The crossing grains do not expand and contract as dramatically as the solid wood products, and so tend to have a lesser chance of pulling apart and forming seams in the floor. These engineered flooring products are also relatively easy to install. They are usually installed with an adhesive, which can be applied either to the underside of the flooring or in the tongue and groove joint, similar to a floating floor. They may also be applied using staples from a pneumatic air nailer. The staples are shot into the flooring just above the tongue at a 45 degree angle. This option allows you to walk on the floor immediately after installation, unlike when you install using adhesive. Floating Flooring: Floating floors are one of the latest trends in flooring. In Scandanavia, these floors have enjoyed a great popularity thanks to their ease of installation and relatively low cost. 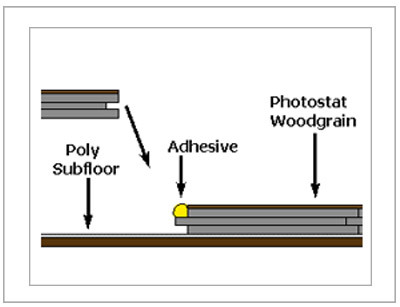 Some of our floating floor systems are made of a High Density Fiberboard with a photostat of different styles of woodgrain laminated on the top surface. 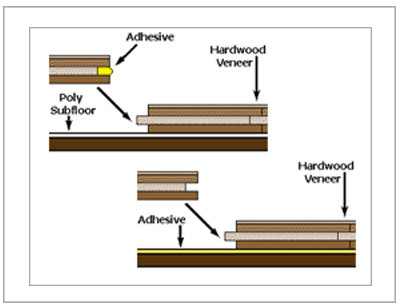 Other products are made through a process similar to how plywood is made, where layers of wood veneer are glued together with the grain set perpendicular to the neighboring layers. This provides strength and stability. This tends to cost a bit more, but it does have an actual wood veneer face rather than a photostat of wood grain. It is then coated with a durable aluminum oxide coating to protect it. The reason it is called a floating floor is that it is not actually attached to the subfloor in any way. The floor simply sits on the plastic matting that works as both a moisture barrier and a cushion. The edges are masked with a moulding that runs along the walls of the room. The individual peices of the floor are held together with glue. 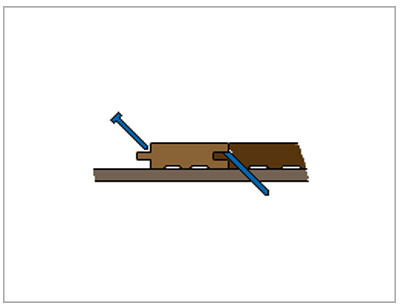 What separates this system from other floating floors is that the glue is applied to the top of the tongue rather than in the groove. This helps create a better seal at the top layer of the floor, which means spilled liquids are less likely to penetrate to the more vulnerable inner layers of the floor. The lack of nails makes this floor especially attractive for those who want a fast, easy, do-it-yourself installation. There are also some floating floors now coming on the market that don't even require glue for installation. They rely upon friction and the new design of the tongue and groove system to keep the flooring in place. To see samples of some of the flooring, just stop by!